According to Sacramento Tree Foundation’s Greenprint: A Regional Urban Forest Initiative, trees clean air and water, reduce stormwater runoff and conserve energy. They also improve public health and increase property values. 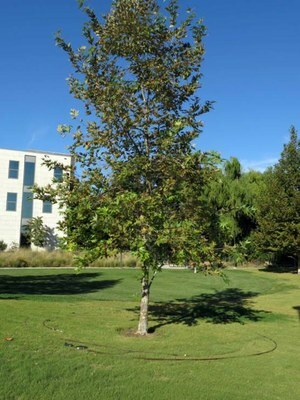 Therefore, during drought conditions, these trees should be the top priority to receive landscape water. In order to water a tree correctly, homeowners need to know what lies beneath the surface of the soil. 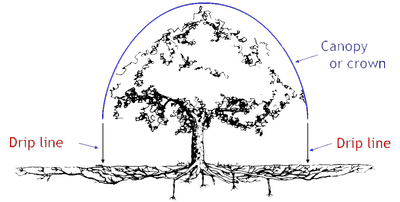 The graphic below depicts a mature tree. The tree roots are found in the top three feet of the soil and extend beyond the “drip line” of the tree canopy, which is the most active water absorption area. Mature trees need deep water during the dry months of the year in order to stay healthy and resist pests and diseases. Arborists recommend applying water to a depth of three feet using a drip irrigation system or soaker hose. 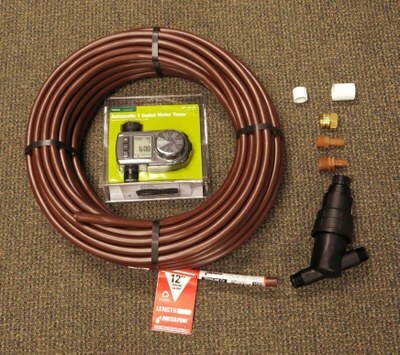 Unfortunately, information on how best to water trees does not exist for drip irrigation and soaker hoses. This is why the CA Center for Urban Horticulture at UC Davis, UCANR and Ewing Irrigation created a unique watering device called the Tree Ring Irrigation Contraption (TRIC). The TRIC is not an item for sale, but rather a kit that homeowners can put together themselves. The total cost is about $100 to make a TRIC for one tree. Larger or more mature trees can be irrigated with multiple drip lines connected together. Most of the parts for the TRIC aren’t found locally and need to be ordered online. Do not substitute other parts/materials otherwise your device will not work correctly. Setting up the TRIC is simple. 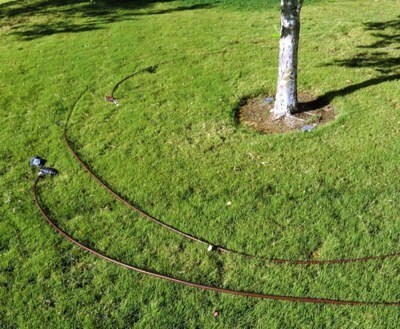 The 100’ drip tubing is placed around the tree one foot outside the drip line in one foot increments as shown in the example below. The tubing is connected to a water system using adapters, caps and a filter. The Netafim Techline CV drip tubing does not require a pressure regulator if incoming pressure is between 14 and 58 psi (consult your drip tubing manufacturer’s pressure specifications to ensure proper operating pressure and if a pressure regulator is required). The timer will shut off water when the appropriate amount has been provided. The TRIC will enable homeowners to adequately water trees to a depth of three feet with confidence. Aside from a parts list, there is a “plug in” calculator created by Dr. Loren Oki, UCANR Associate Specialist in Cooperative Extension Landscape Horticulture for UC Davis & UCANR. The calculator helps determine the run-time needed for the device. To use the calculator, you will need to know your soil type and the radius of your tree canopy. You can find your soil type using the SoilWeb app for smartphones or the Web Soil Survey. Keep in mind that the TRIC uses inline drip tube technology and should be checked periodically to make sure the holes have not become plugged. It can simply be flushed by unscrewing the end cap. Sacramento Tree Foundation. Greenprint: A Regional Urban Forest Initiative. The University of Arizona. Watering Trees and Shrubs: Simple Techniques for Efficient Landscape Watering. UCCE Master Gardeners of Sacramento County. 10 Tips for Saving Water in the Home Landscape.